If you’re working on a large project that requires the moving of large items or large volumes of items, cage tippers could be the perfect solution to your HGV hire needs. Our cage tippers are the latest addition to our hire fleet and are a versatile tipper vehicle, popular for use in a wide range of industries including utility, civil engineering, municipal and highway maintenance sectors. They are like a regular tipper in many ways, but have a large cage structure around them to secure any cargo safely. Our cage tippers have sliding doors and access steps to make using the cage tipper safe and trouble-free. The lightweight end tipper, double drop sides and full height rear barn doors are designed for easy unloading and features such as a tow bar, reverse camero, beacon bar make it a much simpler driving experience. 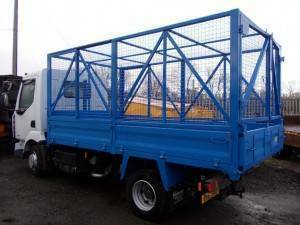 Our main cage tippers are our 7.5 tonne model which is a well suited for both small and large projects. Our cage tippers are available in a wide range of hire options which include short term, long term and open ended contracts. We work with many large businesses as well as individuals who need cage tippers for domestic projects. Our delivery and collection service makes hiring even easier and we know service the entire country through our strategically placed depots – each have their own dedicated hire manager so please take a look at our locations page for more information, or get in touch today. If you have any questions please don’t hesitate to submit an enquiry to a member of our expert team.